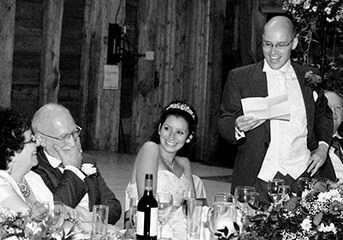 Traditionally the groom’s speech follows the father of the bride’s and is, in many ways, the most important speech of the day. Unless the bride makes a speech, it’s the only one that comes from the most important people in the wedding, you and your new wife. You are the man of the hour and when you rise to make your speech you will be greeted by the biggest cheer of the day. This is your opportunity to thank all those who made the wedding possible, and most of all, of course, the bride for agreeing to marry you. I will help you prepare your speech to wow the home crowd and make the bride burst with pride. Though life will be hectic in the weeks leading up to the wedding, make sure you set aside the time to think about, and rehearse, what you plan to say. Even if you intend only to say a few quick words, you – and your guests – will be eternally grateful if you have prepared thoroughly. Don’t use the speech to bid a fond farewell to your bachelor days. Now is not the time, and if there’s anything worth saying, your best man will say it. If your wife is not making a speech you are thanking the bride’s family for all they have done for her, as well for as welcoming you into the fold. Don’t forget to thank the bride’s father for anything nice he said in his speech, as well as all the members of the family who have contributed financially or in any other way towards the wedding. Think of all the sacrifices your parents have made for you, sitting through those excruciating school plays or watching you play football in the freezing cold. Think of an amusing anecdote or event from your childhood that illustrates the extraordinary lengths they have gone to. In addition to the families, there may be many people you want to thank: those who have traveled a long way to come to the wedding, the bridesmaids and groomsmen etc… While everybody appreciates being thanked, it’s not fun for anyone to listen to an endless Oscar acceptance speech. Keep them short, and think of examples of the unlikely and amusing ways you have been helped. The one story the guests definitely want to hear is how you fell for the bride. The bride’s father and the best man may well tell their version of the story, but the audience will want to hear it from you. This is your chance to share with the audience, honestly and sincerely, how much your beautiful wife means to you. A couple of drinks may take the edge off your nerves, but you won’t be able to do your speech justice if you are inebriated. Keeping a clear head will also allow you to remember this important day. Stay sober, at least until you hear the applause! To avoid embarrassing overlaps, check what the other speakers are planning to say. Ultimately, of course, it’s up to you who each of the speakers thank and toast. It will probably be you who introduces the best man, giving you the chance to say a few words about why you chose him, and forewarning the audience to treat anything he says with a pinch of salt. As long as you thank those who need to be thanked, and have talked lovingly about your new wife, no one will ever complain that your speech was too short. You may be the man of the hour, but people will be grateful if you only claim five minutes! If you would like some help with the writing, editing or delivery of your groom’s speech, book your free telephone consultation on your speech via the contact form, get in touch via email or just give us a call. Together we will assess your needs and make a plan.